Briar Hill sandstone (Massilon sandstone), a Pennsylvanian age rock quarried in northwestern Coshocton County or another nearby county in Northcentral Ohio was used for exterior facing. 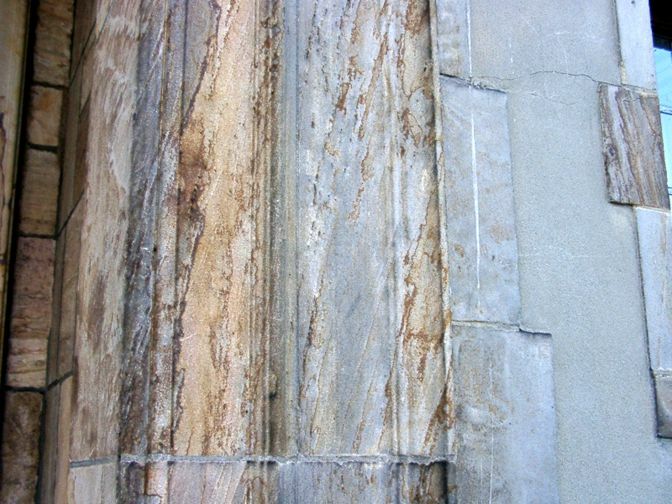 The sandstone is predominantly medium-grained and ranges in color from light and golden brown to red. Much of the sandstone is covered with a dark patina. - Source:Guide To Stones Used for Houses of Worship in Northeastern Ohio.